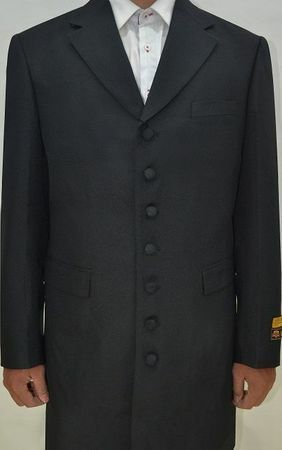 A Mens Black Zoot Suit 3 Piece Long Jacket Alberto Nardoni Zoot-100 is the perfect style to wear out on the town. If you want that classic looking style that takes you back to the 1930's then this is it. Put this on with a pair of two tone black and white wingtip shoes and everyone will be looking at you. The jacket is 36 inches long with 7 buttons and matching pleated baggy pants and vest. Made of Poly/Rayon with a wool feel.